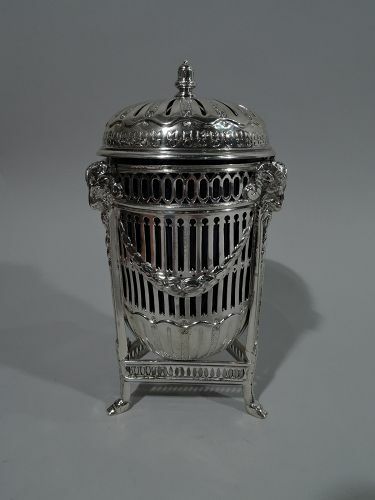 Antique Portuguese Neoclassical silver toothpick holder. Narrow cylindrical shaft surrounded by dolphins on scallop shells supporting ball and mounted to triangular base with pierced scroll-and-shell sides. 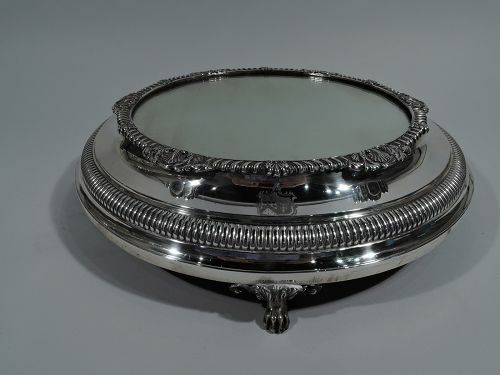 Round tray with scalloped rim and chased scrollwork, in turn, supported by three leaf-mounted paws. 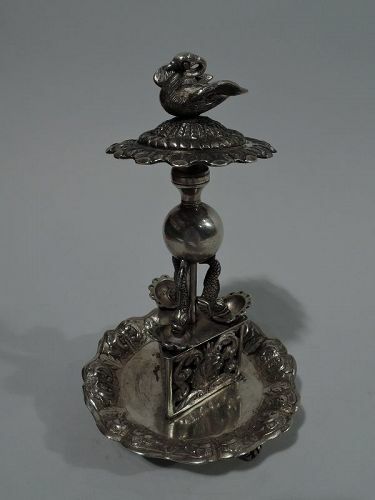 Domed leafy top with swan finial. Pierced on finial, top rim, and scallop shells. Hallmarked (1843-53). Very good condition with deep patina. 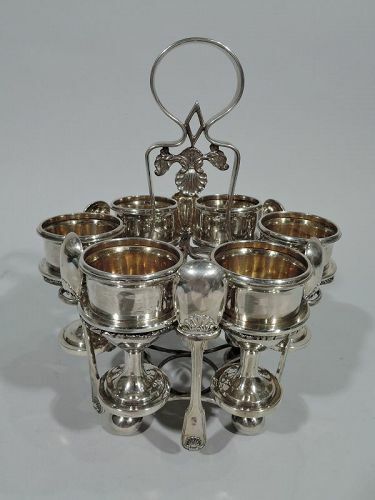 Edwardian sterling silver chafing dish. Made by Gorham in Providence in 1903. 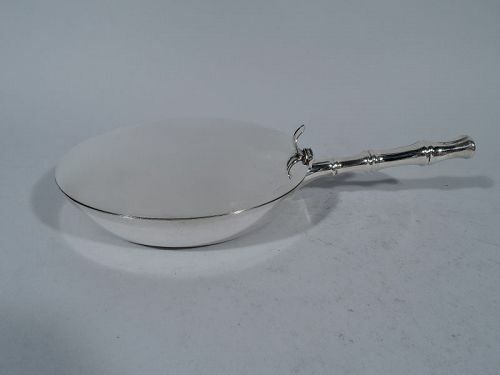 Round dish with wide and reeded rim and carved handle. 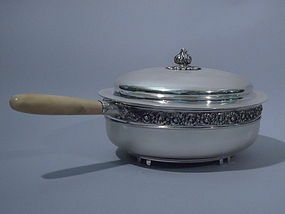 Cover domed with chased and repousse flowers and leaf-mounted c-scroll handle. Rests in central ring with 4 leaf-mounted scrolled supports terminating in paws. Chased floral work and pendant garlands. 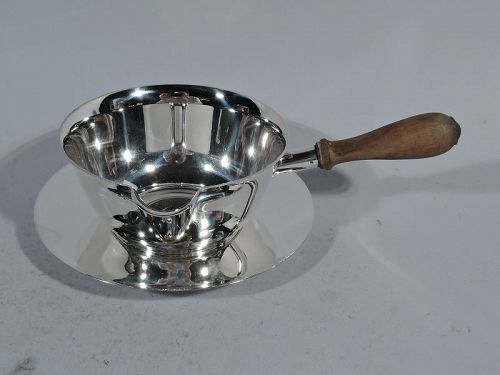 Reeded circular stretcher supports 3-flame heating element. Pretty and practical for the sideboard. 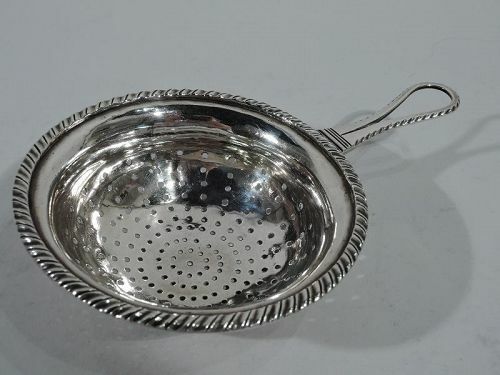 Antique European silver strainer, ca 1840. Round bowl with concentric piercing, gadrooned rim, and feathered open loop handle. On handle back is engraved shaded block monogram NP. Marked. Very good condition. 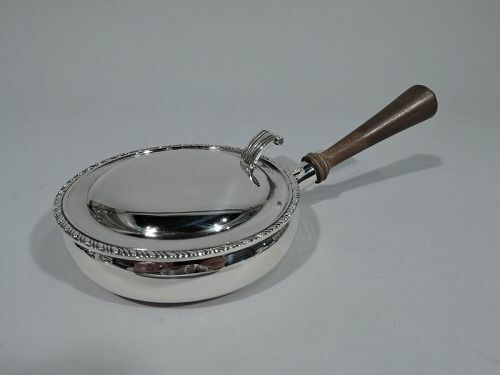 Sterling silver silent butler in Bamboo pattern. Made by Tiffany & Co. in New York, ca 1965. Shallow bowl with curved sides. Cover flat and hinged with fluted thumb rest. Handle bamboo form. 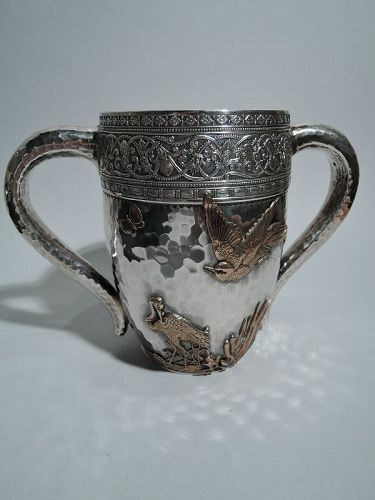 A rare and desirable piece in this pattern. Hallmark includes postwar pattern no. 25063. Very good condition. 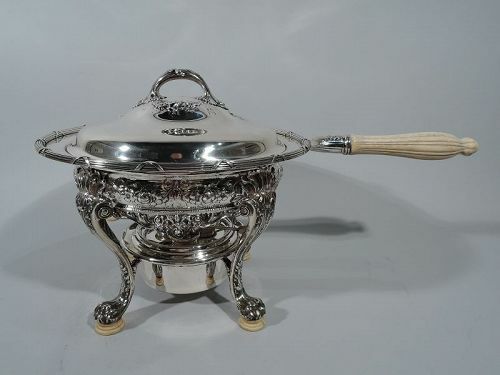 Sterling silver chafing dish. Made by Tiffany in New York, ca. 1900. 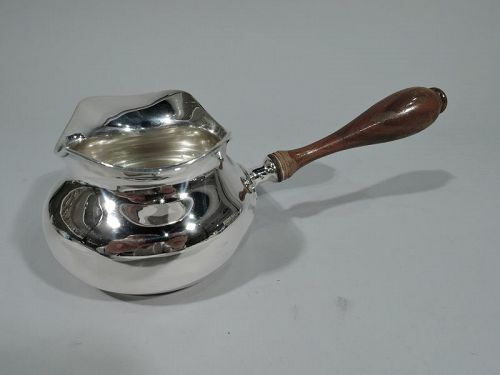 This piece comprises saucepan with cover, insulating bowl, and trivet. The saucepan is encircled with low-relief foliage on stippled ground. The cover has a bud finial. The trivet is circular with open ogee arches surrounding open circle, and rests on bracket supports. The pattern (no. 11079) was first produced in 1891. Excellent condition. Hallmark includes director's letter T (1892-1902).